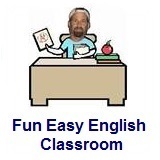 ﻿ Fun Easy English - new classroom free online classes english language lessons speaking listening writing reading january 9. 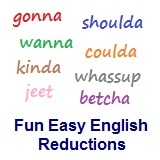 Today in the Fun Easy English classroom you are going to learn about American English reductions. You need to use reductions when you speak English in order to sound more natural. American English reductions are reduced forms of English words. You need to use reductions when you speak English in order to sound more natural. Words like want + to become, or are reduced to, wanna. Reductions, such as wanna are not real words in English. You will be learning a lot of American English reductions in upcoming lessons. For now you can watch the video below. Be sure to learn American English reductions. Although reductions are not real words, and not grammatically correct, Americans still use them in every day conversations. Knowing all the different reductions will also enable you to understand American movies and music. Conversation Lesson - Beginner Level. Let's Learn English conversation lesson with a conversation video, a video script, audio listening practice, video speaking practice, video pronunciation practice, a new words section, and a writing activity. Conversation Lesson 9 - Is It Cold? In this lesson Anna wants to know about the weather in Washington, D.C. She asks her phone. The phone tells her about the weather - but is the phone right? Watch the video and then do the activities on this page. Anna: Oh, hi, everyone! Here in Washington, DC, the weather changes often. One day is cold and windy. But the next day is warm and sunny! So, every day I check the forecast. Hello, Phone? What is today’s temperature? Anna: Eighteen degrees! That is cold! Phone: … eighteen degrees Celsius. Anna: Oh, Celsius. That is 65 degrees Fahrenheit. That’s warm. Phone: Yes, Anna. It is warm. Anna: Excuse me, Phone. Is it windy today? Phone: No, it is not windy today. Anna: Is it sunny today? Phone: Yes, Anna. It is sunny. Anna: Is it snowy today? Phone: No, Anna. It is not snowy. Anna: Today the weather is warm and sunny -- great for seeing Washington, D.C.
Anna: Phone! It is not warm and sunny! It is cold and windy and snowy! Phone: Anna, it is not cold, windy, or snowy. It is warm and sunny … in Mexico City, Mexico. Anna: Oh. I see. Mexico. Anna: Washington weather changes often. Remember to check the forecast -- the right forecast. Anna: Okay, thank you Phone. Goodbye, Phone. In this video, learn to say the new words. Learn to talk about weather and how to make your voice go up or down to show feelings with the word, "oh." In this video, you ​learn how Americans say short answers with no break between the words. check -v. to get information by looking at something, asking about something, etc. What is the weather where you are? You can see some examples in the Activity Sheet. Do the activity and write to us about your town's weather in the Facebook Comments section below. Click lesson activity to get the printable PDF version. The page opens to a new window. Study all 52 English conversation lessons. 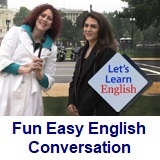 Let's Learn English conversation lessons each with a conversation video, a video script, audio listening practice, video speaking practice, video pronunciation practice, a new words section, and a writing activity. These lessons are for beginners.